Gangster culture took over America. Since the beginning of prohibition, the world has a a strange love affair with gangsters. Thousands of people search for them on the web everyday, people rap about them in music videos, make stylish movies about the types of gangsters and the criminal honor code. Rich ones, poor ones, good ones, bad ones, Japanese, British. . . they're all cool. "Why are people so captivated by gangsters?" After all, these guys kill people. Gangsters remind us of how our lives could have turned out if things had been a different. If only you drove a Cadillac instead of a Toyota minivan. If only you got to snuff people, make big deals, wear nice suits, and get respected for being yourself, rather than sitting at your desk, take crap from your boss, and put the cover-sheets on the TPS reports from now on. If only you didn't have to go home and get thrown up on by the baby, do the dishes, worry about money, and all the little everyday things that we all do but loathe. Gangsters don't do these things. Their biggest worries are making sure they get respected, staying loyal to their friends, and not getting whacked. They stimulate that "bad guy" all of us feel like we have hidden inside. Al Capone dressed in a Suit The same thing that made us play cops and robbers when we were kids, or act like tough guys when we were teenagers. Now as adults, we watch The Sopranos on T.V. or The Godfather Trilogy, at our best we buy a diamond pinky ring, or a Brooks Brothers suit. 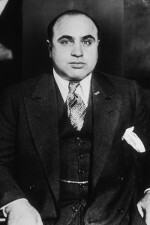 Because of prohibition and the rise of popular media, in 1920 famous gangster characters like Al Capone became very visible in the public's eyes. At this time Chicago was "the wettest city in the world." 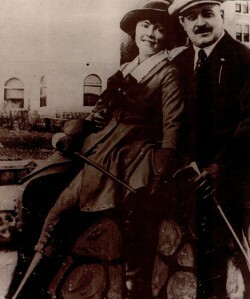 Prohibition gave rise to the powerful crime syndicates led by "Big" Jim Colosimo and John Torrio. These were men who were making over half a million dollars a year off the booze, prostitution, and gambling industry. $500,000 was huge money. A 21 year old flunky at Torrio's 4 Aces Club, called himself a secondhand furniture dealer, went by the name of Al, didn't stay a flunky for long. Al Capone was destined to become the most famous and revered of all the 1920 famous gangster businessmen. Big time crime hit center stage in the 1920s, though gangsters were not a new invention. It was just that making alcohol illegal gave these crime syndicates in New York City, Chicago, Kansas City, Miami a huge incentive to expand their organizations. In 1920 famous gangsters made the speakeasy owners buy their liquor from them, and them only under threat of police intrusion and violence. By 1925, Al Capone had 700 men working for him, and it's said he controlled all 10,000 speakeasies in Chicago. In Chicago from 1925 on, 400 murders were reported every year. This violence culminated when Capone sent his henchman, Machine gun Jack McGurn to kill Bugs Moran who was running Dion O'Banions gang. 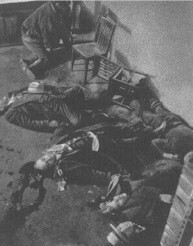 What happened was one of the most famous incidents of the 1920s, The St. Valentine's Day Massacre became the moment that symbolized both the decade of the Roaring Twenties and signified the end of The Jazz Age.